The amount of knockoff products that are selling in China is scary. I mean, I’m sure piracy is a huge problem here in America as well, but for some reason it seems to be such a huge problem in China that it makes the front page news on a regular basis. For example, and ironically the theme is continually centralized around Apple, both the iPhone black market and fake Apple stores have both been front page stories. 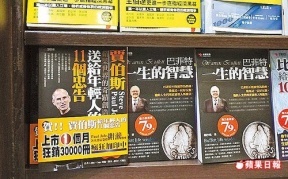 This time, the fake product that’s thriving in China is Steve Jobs‘ (Apple CEO) biography. Of course, it’s not the real Steve Jobs biography, but one something that was probably just thrown together using a combination of other material already printed elsewhere. According to TechCrunch, the fake Steve Jobs biography is “translated” by someone apparently named “John Cage” (presumably there are 4.33 pages blank near the middle), the book has sold 4,000 copies at $10 a pop. The title of the fake Steve Jobs biography roughly reads, Steve Jobs Gives 11 Advices To Teenager.